The most amazing feature of Mirage is her exquisite fiber characteristics. She is exhibiting extreme fineness AND uniformity of that micron to such a high degree, we are quite pleased with this foundation female. Mirage’s blanket is very uniform in micron and color, a very dark gray with both Dam and Sire lines with significant gray with in each line, making Mirage to be a fantastic choice for a gray program. Mirage’s Sire is Treasure Valley’s Tres Equis! 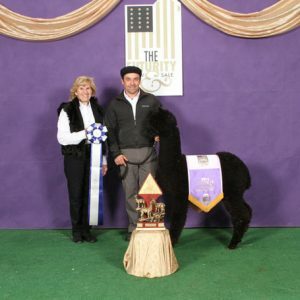 Tres Equis was sold to the Gray Alpaca Company and is a 5X Champion with incredible fineness and density. He now has champion offspring! at 15.8 microns, he is a stellar MRG Herdsire. Mirage’s Dam is Patagonia’s Epiphany. 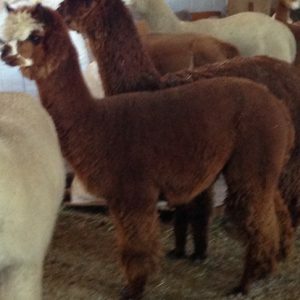 Epiphany is an exquisite alpaca with an appealing head, strong build and excellent fleece coverage. Both epiphany’s dam and sire are silvergrey in color. Her dam is color champion Sinopsis Nocturna daughter. Mirage is confirmed pregnant to Patagonia’s Marengo, our beautiful grey Sire. 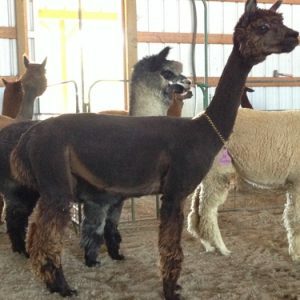 We can’t wait to see her first Cria this fall. EXTREEME FINNESS AND UNIFORMITY! She is truly at the very top of elite histogram data. Mirage is for sale at this incredible price due to slight conformation issue- she is slightly toe out in the rear toes and slight in at the rear knee. We feel that this is NOT a genetic issue, but a lack of vitamin D when she was a cria. We have not seen any of these traits in the genetic line as far as we can determine.